1889-1892 autograph album of Alice May Moore of Bay County, Michigan. By the time of this autograph album, Alice's father had died, and her mother, Elva Hazel (Davis) Moore had married Samuel Alonzo Phillips. The album, which measures approximately 5-1/4" by 3", is battered, with torn pages, disbound pages, and, probably, missing pages. Alice penned a dedication page, which, sadly, is torn. Many of the inscribers were Alice's relatives, and most who gave a residence listed Auburn, Michigan; Midland, Michigan; or Pontiac, Michigan. Note: A Moore, Phillips or Davis family researcher might be able to tease out more names from the battered pages of the album. Alice May Moore was born May 21, 1877 at Williams, Michigan, in Bay County, the daughter of William J. Moore and Elva Hazel (Davis) Moore. Her birth record in Michigan Births, 1867-1902, gives her surname and her father's as More. William J. Moore died on October 19, 1881. In 1882, Alice's mother Elva Hazel (Davis) Moore married Samuel Alonzo Phillips. 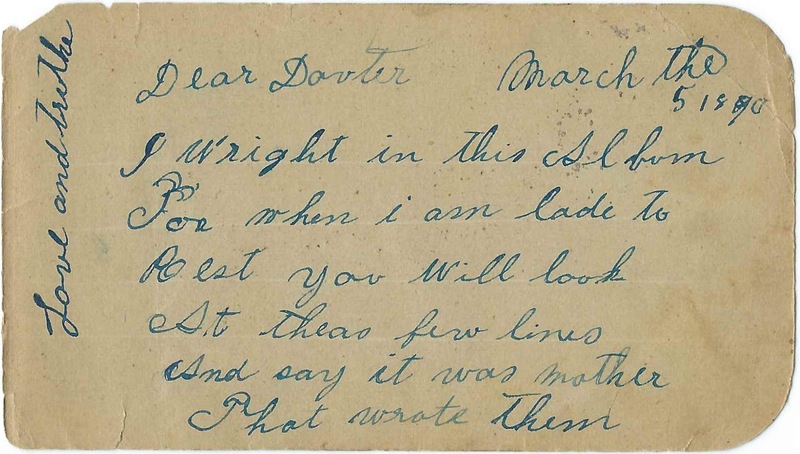 It was presumably Elva who inscribed a poignant sentiment in Alice's album to "Dear Dauter" on March 5, 1890. 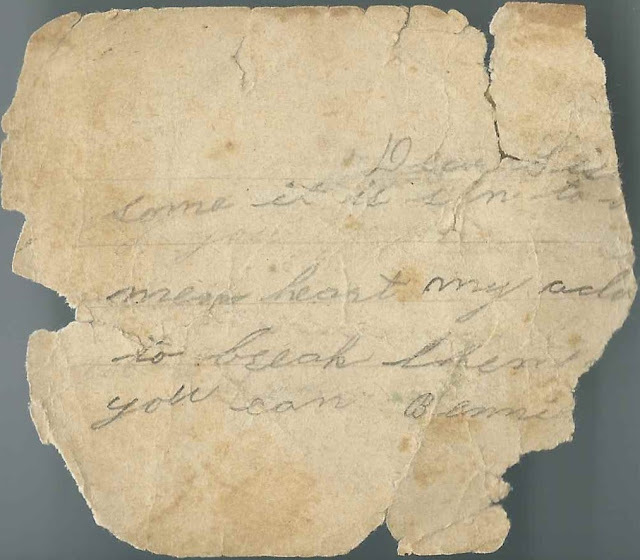 The Bennie who inscribed a torn page, which appeared to be directed to his sister, might have been Benjamin Alonzo Phillips, Alice's younger half brother, son of Samuel Alonzo Phillips and Elva Hazel (Davis) Moore Phillips. Hattie P. B. C. or Hattie P. B. O.
Eva, a cousin. Possibly Eva Davis, daughter of Mabel (Putnam) Davis and Irving Bert Davis, who was a brother to Alice's mother Elva Hazel (Davis) Moore. 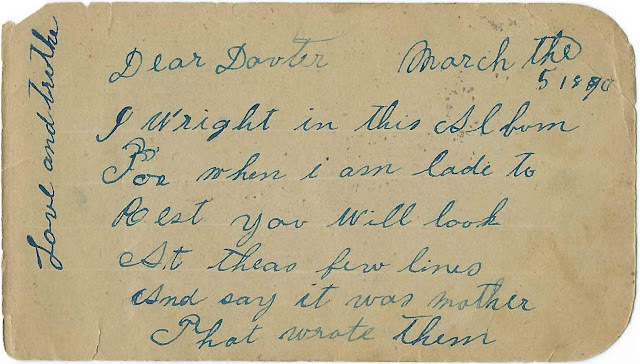 Aunt Lottie Davis; inscribed at North Williams on "3-10-1889. She was Lottie Leona (Horn) Davis, wife of Arthur H. Davis, who was a sister to Alice's mother Elva Hazel (Davis) Moore. Your Uncle; perhaps Charles Henry Horn, wife of Elizabeth Alma (Moore) Horn, who was a sister to Alice's father. Aunt Rosa; inscribed on January 4, 1889 at Auburn, Michigan. She may have been Rosa Belle (Davis) Prateau, a sister of Alice's mother Elva Hazel (Davis) Moore. Minnie Voorhees; inscribed at Pontiac, Michigan, on December 26, 1889. 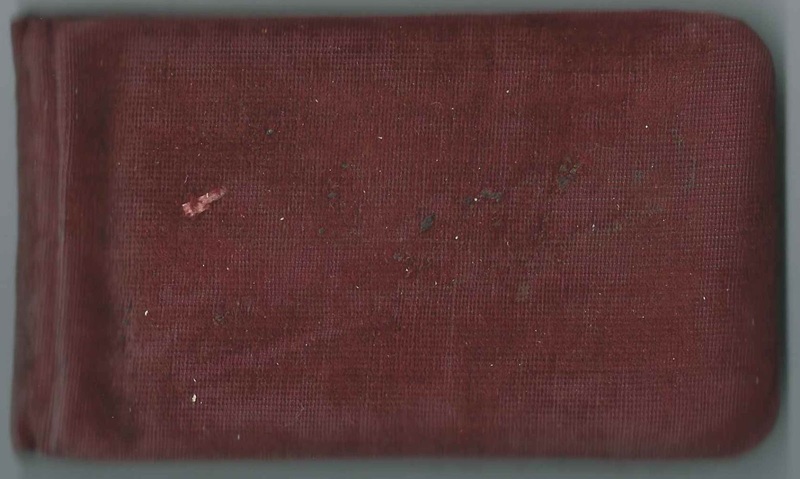 She was Minnie May (Davis) Voorhees, sister of Alice's mother Elva Hazel (Davis) Moore Phillips and wife of Cornelius Voorhees, who inscribed the left facing page. B. E. Allen of Midland, Michigan; inscribed at Auburn, Michigan, on February 12, 1889. Edward H. Richey, inscribed on October 31, 1889. About 1895, after the era of this album, Alice May Moore married Albert Cone and raised a family with him in Pennsylvania, where Alice died in 1918. The informant on her death certificate was her brother Warren L. Moore. Alice is buried in the Phillipsville Union Cemetery at Phillipsville, Pennsylvania, with at least one of her children, perhaps more. Albert survived her. If you have corrections and/or additions to the information above, or information on any of the inscribers mentioned below, please leave a comment or contact me directly. Elmer ? 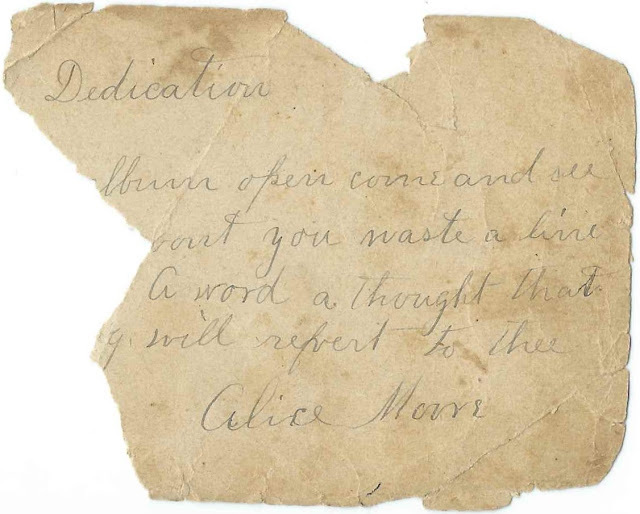 ; inscribed on March 21, 18xx; Alice's schoolmate. Surname might start with "Mers" or "Hers". Page is torn, so surname and year of inscription aren't all there. Aunt M? ; inscribed in December. The page is torn so that any surname, place name or the end of the date are missing.
? ; could be Emery or E. Mary; surname could be Horne. Inscribed on December 16, 1891. Alice's cousin. Eva; inscribed on February 12, 1889. Alice's cousin. Possibly Eva Davis, daughter of Mabel (Putnam) Davis and Irving Bert Davis, who was a brother to Alice's mother Elva Hazel (Davis) Moore. R. S. Johnson; inscribed at Christmas time; possibly the R. S. Johnson who inscribed another page. R. S. Johnson; inscribed on January 3, 1890; Alice's schoolmate. Possibly the R. S. Johnson who inscribed another page. Alice May Moore of Bay County, Michigan; album owner. She penned a dedication page, but the page has tears. Bennie; page is torn but it might be inscribed to Dear Sis, but I can't be sure. If so, he was presumably Benjamin Alonzo Phillips, Alice's half brother. Benjamin's parents were Samuel Alonzo Phillips and Elva Harris (Davis) Moore Phillips. Elva Hazel (Davis) Moore Phillips; inscribed on March 5, 1890. She didn't give her name but inscribed her page to "Dear Dauter". S. S. Randall; inscribed on March 19, 1889 at Auburn, Michigan; presumably the S. S. R. who inscribed another page. C. Voorhees; Alice's uncle Cornelius Voorhees, husband of Minnie May (Davis) Voorhees, who was a sister to Alice's mother Elva Hazel (Davis) Moore Phillips. His wife inscribed the right facing page.